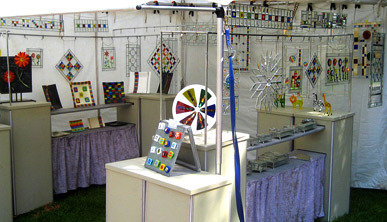 Leonard Wilson, the designer has been performing the art of stained glass for over 30 years. Carolyn and Leonard as a team, specialize in fused glass art pieces, exquisite beveled hangings, and unique glass boxes. The hangings and boxes have been designed, hand cut, and assembled using the Tiffany tradition of foiling. This technique enhances the delicacy of the design, while lending greater structural strength than the conventional method of stained glass using channeled lead. The pieces are soldered together. Copper patina can be applied or the piece can be left silver. Working with the process of fused glass, we design functional and non functional unique art pieces. We also combine fused glass with stained glass. We are members of the State of Illinois Juried Artisan Program. Our work has been selected to be included in the book, "Made in Illinois an Artisan Gallery". 2,200 applicants applied to be included in this book, of which we were one of the 55 selected. We exhibit at many juried fine art shows throughout the midwest and southeast. We have received numerous recognition and purchase awards for the quality of our work. All of our fine art glass pieces are signed, and are one-of-a-kind.